Wow, look at this cool article Larry found. 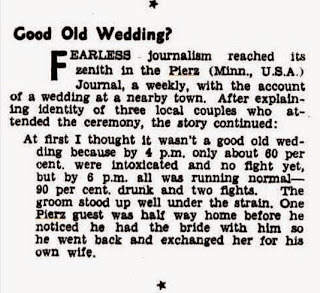 It's a clip from a newspaper in Perth, Australia in late October 1946, describing a wedding in (no doubt) Buckman,"Minn. USA". We all know who wrote it (if you don't, click the "Math Hesch Reporter" label on the left ☺). It's obvious Math felt extremely secure in his relationships with people in the area. My first thought was that it was his nephew Mike's wedding (whoo boy, can you imagine??) but no, Mom & Dad were married a whole month by then. Wasnt there a post-war triple wedding he might be referring to? I seem to remember that we came across photos of it at some point. I'm thinking his referring to the "three local couples" might be our clue. The only multi-nups I can think of were the Kay sibs from LF, but that was 1912, I think. We know 3 Hesch sibs married in 1920, and Math was one of em.